Windows Phone 8 has its own share of problems, the one that is effecting some smartphone buyers is the incompatibility of some popular apps on 512 RAM devices. The list of 512MB devices include the recent launches like Lumia 620 and Lumia 720. Temple Run is one of the game that didn’t support 512MB devices in the past, but now the team says it will support these devices with the latest update. 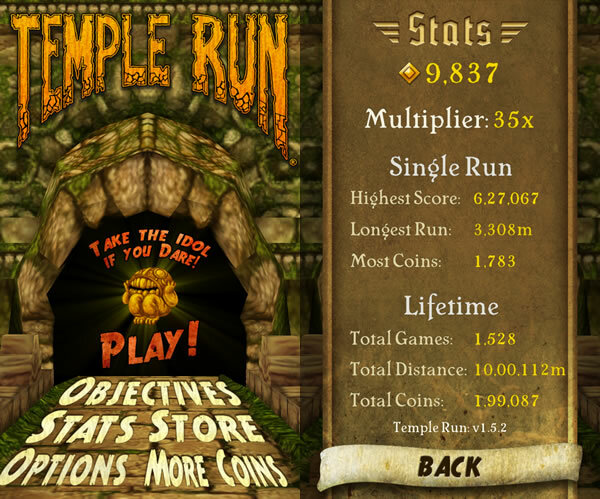 Temple Run received an update that adds support for devices running on 512MB RAM. Some users are reporting that although the team says it supports they are not able to run in on their devices. Check if you can install is now updated to support 512MB devices as well. The update brings the version number from 1.5.1 to 1.5.2 in supported devices. The improvements or changes is not known as there is no change log. If you are Temple Run addict you should check out Temple Run Brave for Windows Phone 8.